The following is an interview with Fernando Pasarin, the artist on the upcoming title Green Lantern: Emerald Warriors. Brought to you buy The Green Lantern Corps Podcast. TheGreenLanternCorps.com:Thanks again for taking the time to speak with us, its really appreciated. So Fernando, can you tell us how you got your break into the world of comics? Fernando Pasarin: Well, I started when I had 20 years of doing a miniseries for a small Spanish publisher. Then I left that job for a small French company but I worked only for a few months until they asked me to do one of those European graphic novels, but as I was doing the first pages, one of the biggest European companies saw them and I started to work with that company. With them, I did a series of graphic novels and had spent 3 years working for them when Eddie Berganza, the editor of the Green Lantern Franchise between a lot of other stuff, came to a con near my city, and although I wasn’t looking for that job at that moment, I always loved superhero comics,and it was the real job that I wanted to do, so I went to see him. I showed him my work and he hired me, although the first year I couldn’t do a lot of work for DC because I had to finish the European project. TheGLC:So the journey into superhero comics wasn’t a rocky one for you at all, great. When we spoke to Editor Eddie Berganza about the decision to bring you on as artist a few weeks ago at Comic Con, he told us that he’s been a huge fan for a long time. So now we know just how long. You were recently announced as the artist for the newest Green Lantern series entitled EMERALD WARRIORS. How did you get involved in this series? Was this the plan back on the Blackest Night: Outsiders issues or just after your Brightest Day #0 issue? GL SPOTLIGHT: Well first let’s dive into Blackest Night: Flash, the miniseries that reunites the highly praised Flash team of you and writer Geoff Johns. How different were these three issues than your time on Flash previously? Have Geoff’s scripts become any more visually demanding than before? SCOTT KOLINS: Rogues Revenge was only loosely connected to Final Crisis. The Blackest Night Flash series story is tied more to the central plot of Blackest Night. Barry is a pivotal figure on Blackest Night and he’s 1/2 the story in Blackest Night Flash. The Rogues 1/2 of this story is a little looser but still connected as they fight some Black Lantern Rogues. Geoff’s scripts are about the same – which means great and very much based on the core story being told. In Rogues Revenge was about revenge (Duh! ), and here it was more about survival – against undead friends and villains! The only new thing – which is actually very old school is that Geoff was so busy working on all aspects of Blackest Night that he would sometimes call me on the phone and we’d discuss the next page or scene and break it down over the phone. Then I’d rough out the page or pages and email that back to him for his approval. It was actually kinda fun this way and we got the book done on time! Join Ryan, West, Andrew, Kuhan, Mew and Ray as they talk to special guests Darryl Banks and Ron Marz! Featuring special guest host bOB Spelled Backwards (http://www.bobspelledbackwards.com)! We talk about heir history, and hints at the future! The following is an interview with artist Rodolfo Migliari who provides spectacular covers for both Green Lantern and Green Lantern Corps among other DC titles. 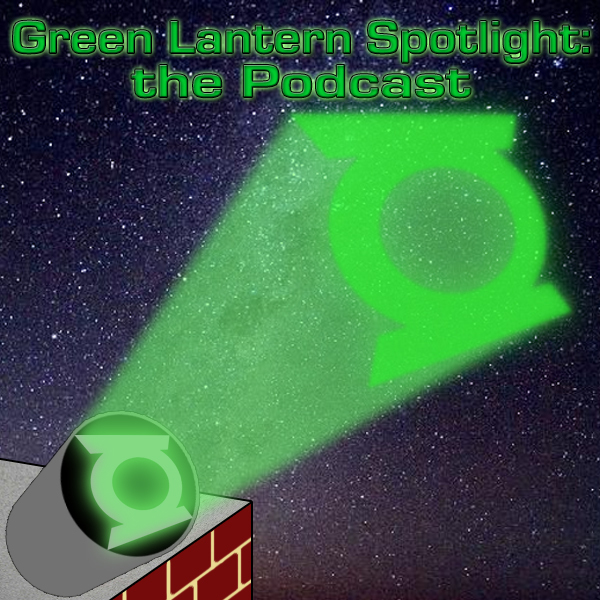 Brought to you buy the Green Lantern Spotlight Podcast. West: Well, first off let me say that I am a new but huge fan of your work. I believe I first saw your art when buying Green Lantern Corps #34. I’d like to know if there were strict guidelines that your editors or Peter Tomasi/Geoff Johns lay down before you get to start a cover. What’s the process like from a cover artist point of view? RM: haha! No, I love to be able to draw and paint the GL universe. Specially now with so many wonderfully design new characters and old ones coming back it’s a lot of fun. I got to work with Eddie and Adam through a very good friend of mine Sebastian Fiumara, he sent Adam some samples of my work and a few days later I was painting my first cover ever for DC Comics, the GL Corps #22 cover the one with Alpha Lantern Boodikka in it. I had worked for all the other companies but never for DC so thank you Adam and Sebastian! West: So how did you originally get into the industry? I can only imagine how strenuous that must have been. We hear year’s worth of tales before getting that “break”. Is it any harder coming from Argentina? West: Just as valuable to us fans looking to track down our favorite creators. I’d hate to draw comparisons, but Alex Ross is one of the industry’s most acclaimed painters. Any chance we see a Migliari painted story like Ross/Waid’s “Kingdom Come” or any other issues? I know there’s a lot of Green Lantern fans that would love to see more of your art. RM: There is no comparison between Alex Ross and me..he is just too awesome! I’ve tried to do fully painted interiors a few times but it takes me too long to finish a page. I can’t see it happening again anytime soon but you never know. For anyone interested there are a few painted interiors in the last DC Universe Holiday special in a Doctor Light short story written by Adam Schlagman and drawn and painted by me with a collaboration of another great friend and artist Max Fiumara. West: Well how long is too long, we’ve waited months in between issues for George Perez’s art. Is it the painting in your work that seems time consuming or your initial sketching? Do you or have you felt that editorial mandated hand coming down upon you for tardiness? West: Ha, neither do we. If you don’t mind me asking, are you DC Comics exclusive? I only ask to know if there’s a chance to see you doing covers for other heroes in the DCU. Is there a title or project out there that you would love to take? Yes, hopefully there is I’ve already painted a cover for Superman # 682 a while ago and maybe there will be more. It’s just a matter of schedule now. I think every character presents interesting visual challenges. Batman has always been a favorite of mine. West: That was a great Superman cover by the way. I love the different people, and of course the Green Lantern shirt in Metropolis. Wrapping things up with Green Lantern, can you give our readers a hint at the next cover on your table? Your latest work was a great John Stewart portrait, I believe. RM: Thanks! The GL Corps #41 the John Stewart cover has some interesting characters in the background that you’ll see once the comic is out The next cover I’m working on is related to Blackest Night and is really cool who’s in it. I wish I could say more. It’s been a pleasure! Thank you! West: Thank you for your time, it was well spent. Green Lantern/The Flash: Rebirth artist Ethan Van Sciver joins the gang to talk about the industry, delays, casting, continuity, and…puppets? Enjoy the laughs, the history, and the greatness of Ethan Van Sciver.